We have two rules in my house - be kind and be safe. Seems simple enough, but with two fearless and rambunctious toddlers its a constant struggle to just keep everyone from mauling each other. Things I never thought I'd say include: please don't pick your sister up by her neck, let's not bang your brother with that boat, can we not pour water on your sister, no I don't think he wants that bucket on his head...You parents out there feel my pain. I mean that literally. These kids bang me up just as much. And is there anything sharper than a toddler's elbow? And why is that how they always push off of you? All that rough housing can work up quite an appetite. This recipe will refill your kids tanks for another round in the rings. Preheat oven to 350 degrees. Line baking sheet with aluminum foil. Slice lemon and lay on on foil. Top with peeled and deveined jumbo shrimp. Melt a stick of butter. Pour melted butter over shrimp and lemons. Dust with Italian seasonings. Place in oven for 15 minutes. At same time boil pasta in salted water according to directions. Drain pasta and return to pot. 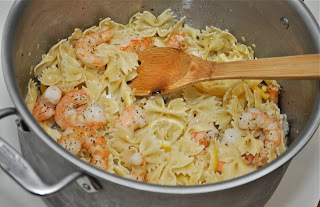 Add shrimp and lemons to pasta. Pour herbed butter onto pasta and stir. Add salt and pepper to taste. Lucky for me my carnivore comes home every night to rescue me from my little rascals. And after a big bowl of this pasta he is ready to rumble too. On the night I served this to the family, I reserved some of the pasta for myself and tossed it with leftover grilled veggies, feta crumbles, and olive oil.